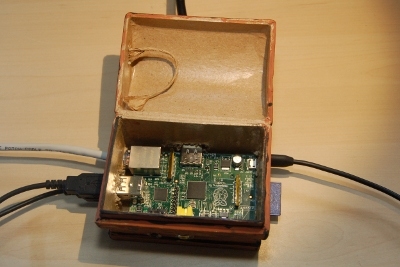 The Raspberry Pi is an inexpensive lightweight computer designed for teaching programming to school children. At the moment it is available as a bare-bones processor board, but there are plans for a cased version in future. In the meantime there are some 3rd parties that have created or are in the process of creating cases. Here is a case of my own which is inexpensive and would be ideal for a young child's bedroom. I've called it the "Raspberry Pirate". Full details of how to create your own are included. This is a cardboard case which has been hand-painted. Access is provided to all the ports. 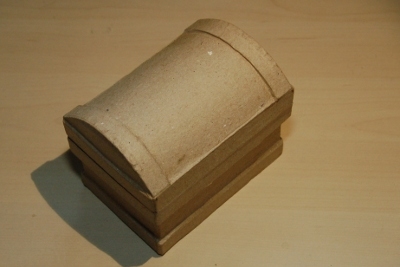 The inspiration for the case came from seeing the basic cardboard box at a Hobbycraft store. I bought the box before I got my Raspberry Pi so I was taking a bit of a gamble that it would fit, but it turned out to be a perfect fit. I first "painted" the box inside and out with a watered down craft glue. This helps to seal the box. I then painted it using children's ready mix paints. Once my Raspberry Pi arrived I then cut out the relevant holes starting with the TV out connector (as it would not fit into the box until that was in place). I found that in most cases the holes needed to be larger than the connectors as the thickness of the edge of the box otherwise prevented the cables from being fully inserted. It is easier if the SD card is connected before the cables as that helps to line up the Raspberry Pi with the rest of the slots, but the SD card can still be removed and re-inserted after the other cables are in place. There is a little bit of movement of the Pi when inserting / disconnecting cables, but it seams to work pretty well. The instructions that came with the Raspberry Pi from Farnell recommend that it is used in a well ventilated area to allow for cooling. You may therefore want to run with the lid open, although I don't know if that is really necessary. 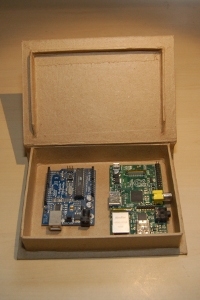 There are other boxes that may be suitable for the Raspberry Pi. 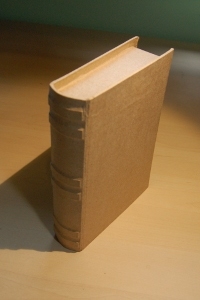 I particularly like the book shape, which is large enough to fit the Raspberry Pi side by side with an Arduino. They also do a Teddy bear or animal shapes which would be good alternatives for a child's bedroom. 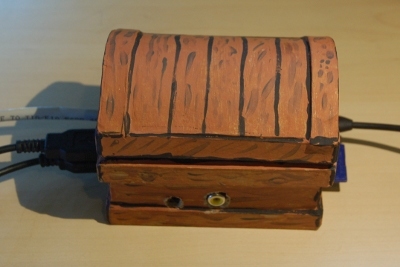 The treasure chest works particularly well as all the ports are still accessible allowing cables to be connected and disconnected, without having to go inside the box. With the other designs then I suspect that the cables will need to be left connected to the Raspberry Pi and just run outside of the case.